The guy on the right is the owner of The Atlantis Book Store in Santorini, Greece. This is it. This is the quintessential haunted house story that I suspect is the actual mother of all haunted house stories that we are now familiar with. Four people (an empirically minded scientist determined to prove the existence of the supernatural, another man of a sensitive disposition, a woman of repressed sexuality and, another woman with an uninhibited sexual libido) head into a home reputed to be haunted. Once there, the house captures the investigators’ imaginations and events play out and, mess with everyone’s psyches. 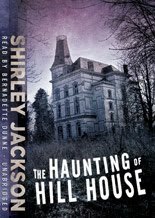 What makes The Haunting of Hill House truly unrivaled among its iterations is the consummate skill with which Shirley Jackson draws the reader into the haunted house along with the four characters. We experience Hill House through Eleanor, a woman escaping her recent past of caring for her dying mother and, the strictures imposed upon her by her sister after the mother’s death. Eleanor approaches Hill House with hopes and daydreams of starting a new time in her life, one filled with white oleanders and white stone lions. Once at the house, the disharmonious architecture creates a setting where the listener isn’t quite sure what is going on. The inherent qualities of Eleanor’s mind and character, her guilt, her wishful thinking, her desperation, all echo through the misaligned halls of Hill House. We are with Eleanor and we understand Eleanor, but is she a reliable narrator of her own story? One is never certain of the reality of Hill House; but the horror of Eleanor’s reality is nonetheless poignant. Bernadette Dunne is pitch perfect as the narrator of The Haunting of Hill House. She hits all the right tones of tentativeness, fear, resolve and confusion of Eleanor. Her voice is evocative and haunting without being too creepy or morbid, dancing on the edge of Gothic melodrama without caving into the temptation of indulging in horror hyperbole, if you will. OTHER: I borrowed a library edition copy of this audiobook form Blackstone Audio, Inc. I receive no monies, goods or services in exchange for reviewing the product and/or mentioning any of the persons or companies that are or may be implied in this post. WHERE WOULD YOU MOST LIKE TO VISIT ON YOUR PLANET?